Over the years there has been a lot of discussion on the value of credentials such as PMP; frequently triggered by the failure of a ‘qualified’ person to perform in the workplace. Competency is demonstrated in a specific a time and location. There is no guarantee the competent person will perform as well in a different setting with different people, cultures and relationships. The assessment of interpersonal competencies tends to be subjective and project management is very much focused on directing and leading people. Assessing behavioral competencies goes some way towards solving this dilemma but the assessment is still subjective. There is no indication the person can apply the knowledge effectively in the workplace. The knowledge tested in any exam is only a portion of the overall domain knowledge. Its recognition by other entities offering higher qualifications through credits or advanced standing. The value of a qualification to an employer is in part a function of the credentials reputation and in part, what this tells the employer about the credential holder. Whilst the PMP is a uniquely valuable industry based credential, no single assessment is ever going to provide a guarantee of a person’s suitability for employment in a particular organisation. Being a PMP provides one point of assessment; the PMP holder had the knowledge needed to pass a difficult, quality controlled exam. However, employers also need to look to other aspects of a person’s overall capabilities as well. My feeling is the lack of undergraduate/baccalaureate degree courses in project management has given PMI’s PMP and other similar project management certifications a solid value in the job market. This is quite different to many other credentials issued by professional bodies. The UK based Chartered Institute of Building’s MCIOB credential requires a degree, several years experience, an examination and a professional interview; in most respects at least equal in its rigor to PMI’s PMP requirements. Both credentials should be assessed as being at a higher level than a degree but at least in the Asia Pacific region, the construction industry and governments focus on building managers holding a University construction degree, not MCIOB. Similarly, higher degree courses in project management routinely offer some level of advanced standing for PMP holders. I am unaware of any advanced degree in construction or the built environment that offers similar advanced standing for MCIOB, although some other professional credentials do achieve a level of advanced standing in some higher degree courses. Employers may have expectations of PMP holders not supported by the credential. But, credential holders need to live up to the reasonable expectations of their employers, and current credential holders also have the challenge of maintaining the worth of the credential for future generations of PMs. PMI needs to ensure the examination process remains both credible and effective. Training organizations such as ours need to ensure their PMP courses are relevant and interesting. We have chosen to focus our training on the PMI range of credentials because they are a defined package, we know if we have done a good job as soon as a trainee passes their exam. The subjectivity of competence assessments lacks the clarity of pass/fail. However, look 5 to 10 years into the future and I expect the credentialing process will have change substantially to blend aspects of workplace assessment (competency) with the formal testing of knowledge. The Program Management Professional (PgMP) credential is a start along this route, my prediction is most other credentials will follow. Providing details of the work to be done this week by maybe 2000+ people. 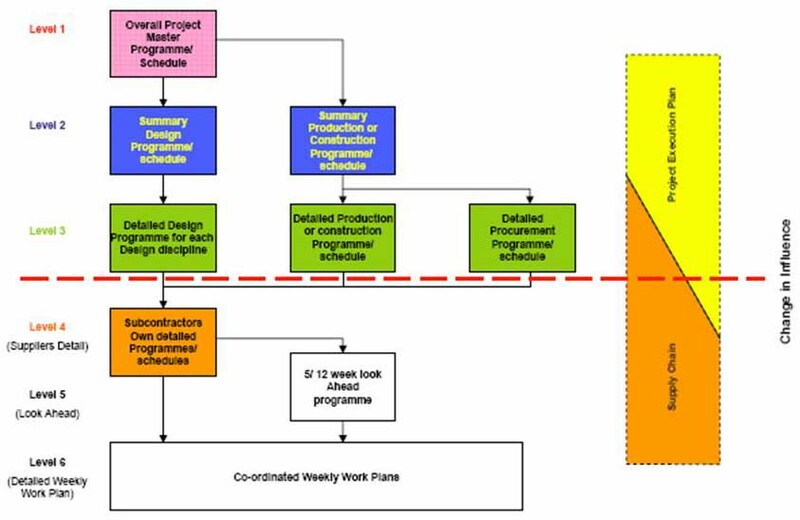 The Guide to Good Practice in the Effective Management of Time in Complex Construction Projects (CIOB, publication mid 2010) invokes two concepts to achieve this task. The first is the idea of ‘schedule density’ discussed in my November ’09 post. The final draft of the standard maintains the recommendations of planning the overall project at ‘low density’, expand the work for the next 9 months to ‘medium density’ and the next 3 months at ‘high density’. The second concept is the idea of schedule levels, potentially aligned to a WBS. The schedule levels in the standard are very similar in definition to those in Mosaic’s Planning White Paper, ‘Schedule Levels’ this means the CIOB standard is generally aligned with long established practices pioneered by Bechtel, Flour and other major contractors. Using dynamic linking between the different schedules in the coloured boxes the intent of both levels and density can be accommodated. If this is achieved, the project schedule should change from a static tool used as evidence in disputes after the event to a proactive management tool focused on achieving the best possible time for completion of the project. Which was after all, the reason CIOB started on this task and why many volunteers from around the world (including me) have been happy to contribute time and resources. Even if you are not in the construction industry, this standard will be a valuable resource – watch this space for news of its publication! 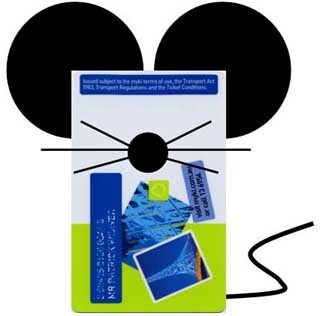 Taking the Myki (or should that be Mickey)? Myki is another $billion plus government IT project that is years late, $100s of million over budget and that has been de-scoped to the point where there is almost no point in continuing. The city of Melbourne, Australia, desperately needs an updated public transport ticketing system. Several years ago a grand scheme was developed that became Myki. Myki was intended to be the key to city living; acting as a cash card, transport ticket and fulfilling a range of other useful functions for the citizenry. Because of its wide scope, existing public transport ticketing systems in use around the world were deemed not acceptable; the Government needed a brand new special system designed for the unique needs of Melbourne. Several years and $100s of millions later a majorly de-scoped Myki that is purely a public transport ticketing system may eventually be launched and actually work. The latest commitment made this week is for the system to be working by the end of 2010. This is identical to the commitment made mid 2009 after an earlier commitment for the system to be working by mid 2009 slipped. I am sure there will be books written on this project and it may even contribute to the demise of the current Government at the elections next year but for now I want to take a quick look at some of the common governance failures Myki seems to have suffered from. The NIH problem – an amazing number of organisations seem to believe that the only acceptable solution is something developed exclusively for them. NIH = Not Invented Here; if it’s not NIH, it cannot be any good. Generally the arrogance associated with NIH is closely aligned with the pride before a fall. The internal SES problem. SES = Simple, Easy, Safe. This is a very dangerous and surprisingly common problem particularly in government and defence bureaucracies. To obtain funding approval, the bureaucrats promoting a project need to convince a risk shy decision maker (typically a Cabinet) that the project is simple and well understood, easy to implement and there are no significant risks to time, budget and performance parameters. The external SES problem. SES = Simple, Easy, Safe. To win the work, the successful contractor has to convince the client’s decision-making team, that the project is simple and well understood, easy to implement and there are no significant risks to time, budget and performance parameters and their bid can be relied upon. The intrinsic knowledge problem. SES can only flourish in an environment of ignorance. This may be wilful ignorance where people do not wish to hear or organic where senior decision makers simply do not know what they do not know. SES also needs an organisational culture that prevents more knowledgeable junior staff from properly informing their seniors of the real issues. Typically in these circumstances senior decision makers will take the advice of external advisers who have a vested interest in promoting their version of SES over the opinion of internal expert’s who are too junior. The first interesting decision around Myki was the selection of the company to deliver the ‘project’. None of the organisations world-wide who had real, current knowledge of developing and installing ticketing systems were successful. They probably understood the challenges and issues and priced accordingly. The winning contractor and the government would appear to have happily accepted SES! As a consequence of SES, everyone has continually talked about the Myki project, with a fixed timeframe and budget. As originally scoped Myki was a major program of work. Managed as a program with the progressive delivery of value by a series of carefully scoped projects the outcome may have been very different. However, accepting Myki as a program would have meant there could be no pretence of certainty concerning the overall timeframe or budget. The Government would have had to accept there was uncertainty (risk) and managed the overall program to create value for the tax payers and transport users. This level of risk management maturity may be impossible in a political environment. The consequence though is cost overruns, time overruns and a major reduction in value through de-scoping. However, if proper value management systems were in place within a program management framework, many of the ‘bright ideas’ from Senior Ministers and bureaucrats that moved in and out of scope cold have been far more effectively assessed, managed and where they contributed value, implemented. Effective project and program governance is not about eliminating risk, this is never possible; it’s about understanding and managing risk. One of the key conclusions in my paper The Meaning of Risk in an Uncertain World was that the client bears the ultimate risk for any project, if the project fails, the client pays the costs. Contracts rarely provide protection against the consequences of a fundamental failure! The first critical step in effective and ethical program and project governance is to fully understand the parameters of the work (see: Eddie Obeng’s typology in Projects aren’t projects – Typology), and then managing the risks and delivery mechanisms appropriately. My prediction is the post-mortems on Myki will show root cause of most of the issues was a treating a ‘Walk in the fog’ program to resolve a problem as a simple ‘Painting by numbers’ project. If this prediction holds true it will demonstrate a fundamental failure of governance. Watch this space for more…… in the meantime I have applied for my Myki card and do expect to use it sometime in the not too far distant future. One of the impacts of the global financial crises has been for many people to defer their plans for retirement. From a physiological perspective this is quite achievable, people currently approaching their 60s were born after World War 2; their parents were children during the great depression of the 1930s and then went through the depravations of the war years. From a physical health perspective today’s 60 year olds are probably similar to their parents in their 50s. If this hypothesis holds true, the end of a baby boomer’s effective working life should be nearer to 75 than 65. Diversity has long been recognised as contributing value to teams. Including older workers in a team contributes to diversity. Older workers have a lifetime of accumulated experience and provided they remain adaptable and ‘current’ can offer any project team a range of valuable capabilities ranging from wisdom and maturity through to teaching and mentoring. There are interesting challenges though; the older person has to remain flexible and adaptive. The only best answer was not found 20 years ago and the tendency to become ‘set in ones ways’ is the biggest threat to the effectiveness of the older team member. Experience and lessons learned on past projects are valuable but need to be introduced to the team in subtle and sensitive ways. Managing older workers also needs to take into account some of the immutable effects of ageing. Stamina and endurance levels reduce as people get older, the skeletal frame becomes more brittle and injuries take longer to heal. The solution is flexible working and if physical work is involved more careful job design. Whilst many older people find a ‘granny nap’ in the early afternoon helpful, after the nap they can keep on working until late at night (another effect of ageing is a reduced need for sleep). Similarly, many older people have learned disciplined work habits and will remain focused on a critical but uninteresting job far longer than youngsters, making fewer mistakes. The biggest challenge is for young project managers faced with the prospect of managing someone nearly as old their parents. The young leader has to avoid becoming defensive and develop a productive working relationship using techniques similar to those used to ‘advise upwards’; assisted by the structural authority the project manager has over team members. Both sides of the relationship have to adapt but the advantages of applying good stakeholder management skills to make the relationship effective can have major benefits for the project, the project manager and the older worker. Many skills are going to be in short supply as the recovery cuts in around the world and older workers represent a valuable pool of knowledge and talent. The demographic changes in most western societies are immutable; add in the effect of the GFC and those organisations and managers who learn to make effective use of the resource pool created by older workers wanting to stay in the workforce will have a significant advantage over those organisations that focus exclusively on competing for the diminishing pool of young workers. Planning is a social process! Schedules cannot control the future, there are numerous posts on this blog and papers on the Mosaic scheduling home page that explain why. Bookies and casino owners make money, this would be impossible if people could predict the future. I have also been posting and writing on the value of scheduling as a way to develop a communal view of what might be a good ‘future’ and the power of the schedule to influence people’s decisions and actions to help create that future. The schedule is a communication vehicle and needs to be as simple as possible to make sure the message is understood. Whilst it is implicit in the stuff I have written, one of the elements that has probably been understated is the critical need to involve the project team in developing the project schedule if they are going to accept the schedule as ‘theirs’ and work to make it happen. This is where Simon’s dragged me back to ideas we used to teach 10 to 15 years ago. To start with, people really do think better on their feet; the cerebellum is important for physical movement, cognitive thinking and importantly planning future behaviour. The standing and moving associated with a Post-It Notes planning session (PIN-PS) helps the thinking. Negotiating and debating ideas in a non-confrontational way needs the idea under discussion to be separated from the person. Focusing on the PIN-PS means looking at the wall; eye contact is minimised and the ‘idea’ (ie, the Post-It Note) is separated from the person. The interpersonal challenge is minimised. Everyone can contribute, draw lines, move the notes and discuss the options. No-one controls the keyboard! This allows group consensus to be reached and group ownership of the outcome. The photograph of the finished wall is the single version of the truth. The physical limitations of the process prevent too much granularity. Excessive detail does not assist understanding or accuracy. The power in the process is not the physical elements of the PIN-PS it is the discussion an shared understanding that’s developed. Later as the project schedule hits the inevitable problems this shared understanding allows options and solutions to be reached quickly with team buy-in. But before rushing off to try a PIN-PS there are a few tips…..
Use glass or paper as a background – Post-It Notes don’t stick well to whiteboards once they have been cleaned or vinyl wall coverings. Whiteboard markers work well on glass. Cotton or wool can be used for link lines if whiteboard markers will leave a permanent stain (most paints, cloths and papers). Peel your Post-It Note off the pack from the side – if you peel from the bottom the gummed portion curls and does not stick well. If you think this is just plain common sense as a final thought Simon defines common sense as “that which is commonly considered right and proper when observed”, not “that which anyone and everyone has already thought of”. Stakeholder management is a key facet of organisational management where stakeholder management is often aligned with marketing, branding and corporate social responsibility (CSR) initiatives. Similarly, stakeholder management central to change management and the ability to realise the benefits the change was initiated to deliver. The benefits will not be realised unless the key stakeholder communities accept and embrace the changes. Project and program management also has a focus on effective stakeholder management. In a change initiative, the project and/or program undertakes the work to deliver the elements needed to facilitate the change but are only ever part of the journey from concept to realised value. The organisation decides on a major organisational restructure and as a consequence initiates a change management process and appointed a change manager. The change manager develops the business case for the program of work and the executives responsible for the organisations portfolio management approve the business case and agree to fund and resource the program. The program manager sets up the program management team, established the program management office (PgMO) and charters a series of projects to develop the various deliverables needed to implement the change. The projects deliver their outputs. The program integrates the outputs with the operational aspects of the organisation. The organisation’s management make effective use of the new systems and processes. Value is created for the organisation and its owners. The change manager is the sponsor and primary client for the program but the people who need to be convinced of the value of changing are the operational managers and their staff. If the organisation does not accept and use the new systems and processes very little value is generated. They are stakeholders in the organisation itself and part of the organisational hierarchy. They are stakeholders in the change process being managed by the change manager. As end users of the new systems and processes they are also stakeholders of the program. As subject matter experts (SMEs) they are likely to be stakeholders in at least some of the projects. In one respect change management is stakeholder management. 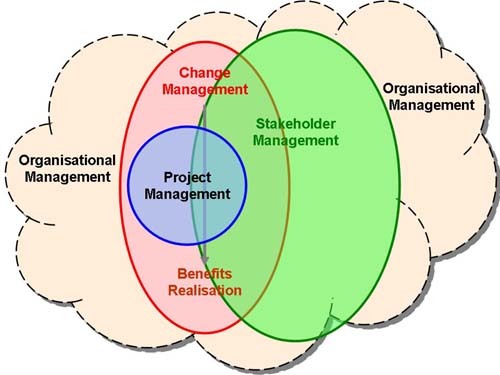 Therefore, in a change management initiative, stakeholder management should be an integrated process coordinated at the change manager’s level. All of the organisational elements working on the change need to coordinate their stakeholder management efforts to support the overall outcome. Confusing and mixed messages don’t help anyone. But this is just one typical business scenario. When considering stakeholders, there are very few one-to-one relationships. Most stakeholders are, and have been, influenced by a range of relationships in and around your organisation. Consequently, focusing on a simple one-to-one view is unlikely to provide the best outcome for anyone. Effective stakeholder management requires a mature organisational approach. One approach to developing this capability is the SRMM (Stakeholder Relationship Management Maturity) model described in my book. Stakeholder Relationship Management: A Maturity Model for Organisational Implementation. I will outline the SRMM model in a later post.